Canvas @ YaleInstructor Guides Permissions & RolesHow do I edit user roles in a course? How do I edit user roles in a course? 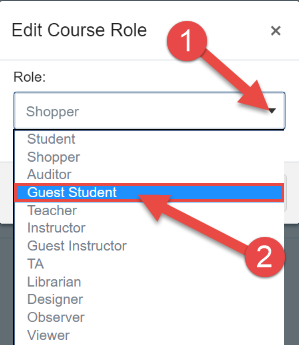 You can edit the course roles for those students you have manually added to your course. You cannot edit the course roles for a student who is officially registered for a course and their enrollment listed in the registrar's database. If you must, change the role of an officially registered student, please contact canvas@yale.edu. In Course Navigation, click the People link. Locate the user in your people list. Hover over the user's name and click the Settings icon . Select the Edit Role  link. Click the Role drop-down menu , then select the new role for the user . 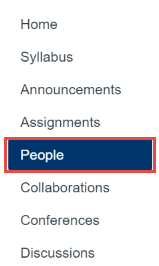 Note: Depending on your user permissions, you may not be able to select from all user roles in your course. 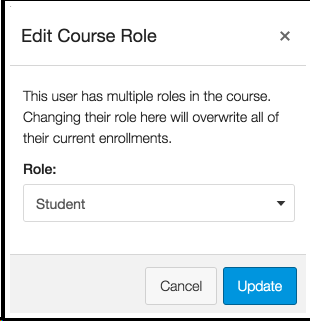 If a user has multiple roles in the course, selecting a new role overwrites all the user's current enrollments. How do I add users to my course? Next: How do I participate in the PollEverywhere pilot? How do I Communicate with my students? How do I Create an Announcement? How do I create Assignments? How do I Grade Assignments? How do I create Media Recording Assignments? How do I post my Syllabus in Canvas? How do I use Conversations (Inbox)? How do I Create a Discussion Board? How do I use the Email Lists tool? How do I use the Sign-Up Tool? How do I create folders in my course "Files" area? How do I upload a file to a course? How do I submit audio/video feedback to a student? How do I Create Groups? What is the Media Library tool? How do I add media files to the media library? How do I create a video assignment? How can I share a video? How can I share a folder? How can I see other folders I have access to? What are the search features? How do I move my media? How can I copy/move multiple items to another folder? How instructors and students can comment in video? How can I see viewing habits? How do I record my own videos using Panopto Recorder? How do I migrate Media Library course content from one library to another? How do I find and move content that was in Media Gallery? How do I add and edit captions? How do I Create Modules? How do I participate in the PollEverywhere pilot? How do I import a class roster from Canvas in to TurningPoint? How do I update a class roster in TurningPoint? How do I enable ResponseWare to allow mobile device use? How do I modify the Default Notification Settings? How Do I Change My Course Name and Course Number in Canvas? How Do I Create A Web-Link in My Course Navigation? How can I see what the students see? How do I re-organize my Course Navigation? How do I publish or unpublish my Canvas course? How do I restore deleted items? How do I create a zip file?